An effective air quality management program requires reliable information on ambient air pollution with substantial spatial and temporal coverage. This information is collected and collated via monitoring campaigns (using on ground systems and part support from the satellite measurements). This is also an ideal database to statistically forecast air quality for the next 3-4 days, knowing how the pollution levels behaved in the past under similar meteorological conditions. However, this database is not enough to explain the highs and lows, source contributions, and spatial patterns of pollution, especially in an environment where the monitoring database is limited. In such a case, forecasts based on multi-pollutant chemical transport modeling systems is a necessity. and complementary in not only providing support to short-term pollution and health alerts, but also for long-term pollution control planning. 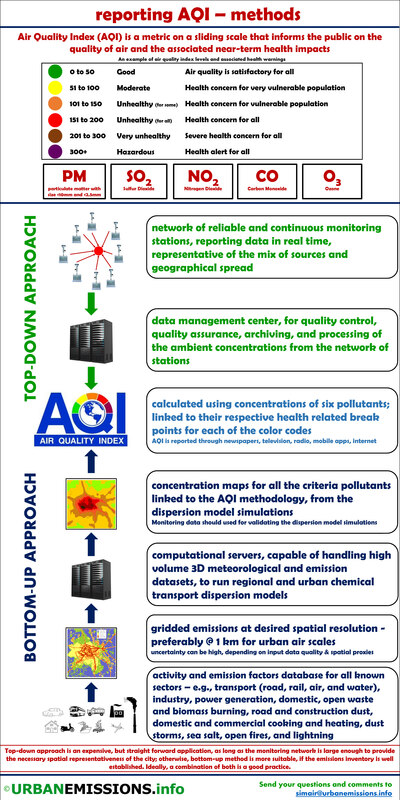 The infograph below demonstrates how one can build the air quality index using the monitoring and the modeling databases.